If you are a true guitar fan and you are looking to buy a new guitar, then you would know that buying a new guitar is not an easy job to do, especially when you are on a close budget. Although there are many options available even in such a short window, it is very difficult to narrow down the search to a single piece that would satisfy all your needs. There are many things to be considered such as the manufacturer who is producing the guitar and the level of music the guitar delivers. Also other things such as the quality of the material used and the details that were paid during its craftsmanship. Also compatibility of the guitar with the accessories such as picks, tuners, slides, etc. should also be considered while buying the guitar. We have done some research and have shortlisted such top 10 guitars which are available under the budget of $200. 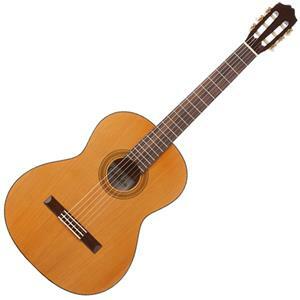 The Cordoba C3M Classical is a classical guitar with a great natural look and an amazing sound. 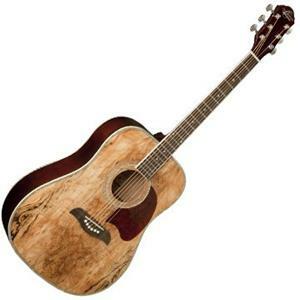 The guitar has a solid cedar top and it is made up of all natural wood with hand inlaid rosette. The guitar has a natural matte and a satin finish which enhances its looks. It also allows the resonance to sustain and thus in terms helps to generate great music. The bridge of the guitar is made of rosewood. The fingerboard of the guitar is also made up of rosewood. The back and sides of the table are made from mahogany. This a middleweight guitar weighting around 16 pounds. The guitar also has a two way truss rod built on its neck which adds stability to the guitar. It also helps to make the guitar more durable. 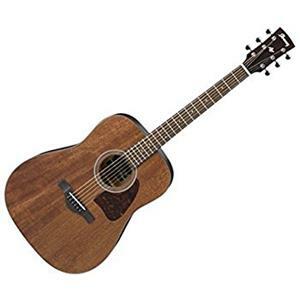 The Fender Acoustic-Electric CD-140SCE has a one piece body style which makes the guitar very attractive and helps to deliver great acoustics. The guitar has a solid spruce top along with X shaped bracings. The side and the back of the guitar is made up of rosewood. The neck of the guitar is slim and due to its rolled edges, it becomes very easy to grip on to. Also, this firm gripping, gives the guitarist a much needed comfort which in turns helps to enhance his performance. The body and the fretboard material used is rosewood which helps with the tone. This is a very light weighted guitar as its weight is just around 7.3 pounds. Also the natural light shade of the guitar along with a beautiful design on the top of it makes it very elegant. 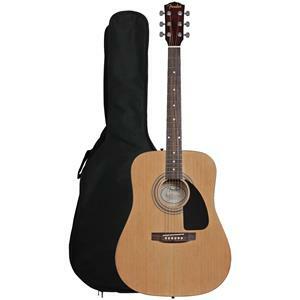 The Yamaha FG700S Solid Top is a 6 string acoustic guitar, which is considered great for beginners. It has a solid spruce top made up of sitka while it has die casted tuners. The fingerboard of the guitar is made of rosewood, while the body is bonded using black and white binders. The guitar has a nato back and sides. The guitar has a high gloss natural finish which makes the guitar look very beautiful and its beauty enhances under the stage lights. 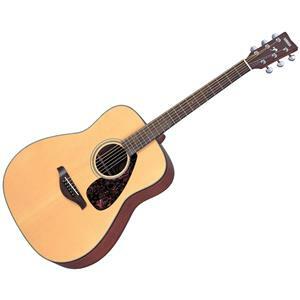 This guitar is also considered as a great choice for recording and finger picking. Also the size of the guitar is smaller than normal. Hence it makes the guitarist more comfortable to hold it and to play it as well. This is a very lightweight guitar weighing just around 5.1 pounds. The Oscar Schmidt OG2SM is a guitar which is made in dreadnought style. The guitar has a spalted maple top while its sides and back is made up of catalpa. The fingerboard of the guitar is made up of rosewood. The body of the guitar is made from mahogany. The bridge of the guitar is also made up of rosewood. The guitar has a high gloss finish which enhances the beauty of the guitar and makes it look appealing. This is an extremely light weighted guitar weighing just around 3 pounds. This guitar is preferred by a lot of guitarists mainly because of its weight and its accessibility. Also the guitar looks like natural tree wood which gives it a unique look to which many guitarists are attracted. 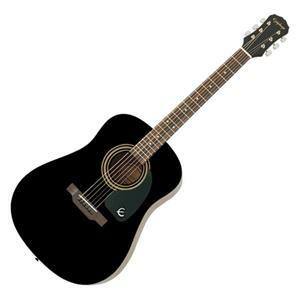 The Epiphone DR-100 Acoustic Guitar has a fingerboard constructed from rosewood. The top of the guitar is spruce shaped and is specially selected for this guitar. The headstock of the guitar is 14 degrees, which adds more pressure at the nut. This helps to give a sharp sound from the strings when even a small vibration is made. The body of the guitar is made from mahogany which gives great acoustic to the guitar. The fretboard of the guitar is made from rosewood as well. It is a 6 string guitar, which makes it easy to learn and play as well. It is a medium weighted guitar. The weight of the guitar is around 8 pounds. The great design and beautiful color of the guitar makes it very desirable. The Ibanez AW54OPN Artwood Dreadnought has a beautiful dreadnought body. The top of the guitar is solid and is made up of mahogany. The back and sides of the guitar are also made up of mahogany. The neck of the guitar is slim which makes it comfortable for the guitarist to hold on to. It also helps the guitarist to enhance his performance due to the increased comfort level. Also the neck of the guitar is also made from mahogany as well. The bridge and the fretboard of the guitar is also made from rosewood as well. The guitar looks as a traditional guitar from its looks, but it holds the features of a modern guitar. It is a light weighted guitar weighing just around 4.5 pounds. 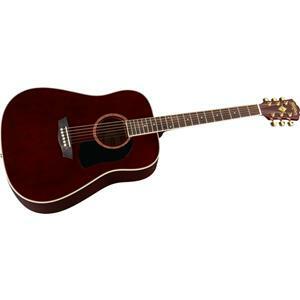 The Washburn WD100DL Dreadnought Mahogany has a dreadnought body which helps to enhance the quality of music generated. The top of the guitar is made up of mahogany. The neck of the guitar is a little slimmer than others which helps the guitarists with small hands to hold it properly. Also the neck is made from mahogany. The fretboard of the guitar is made from rosewood, while the tuners of the guitar are die cast. The bridge of the guitar is also made from rosewood. The back and the body of the guitar is also made from mahogany. This is a 6 string guitar which is preferred by any guitarists. The acoustics of the guitar are really great. This is a medium weighted guitar weighing just around 8.2 pounds. The Jasmine S34C NEX is a stylish guitar with a great natural gloss. The shape of the body is really curvy and the craftsmanship of it is real neat. The guitar has a laminated spruce top. The back and the sides of the guitar are of sapele. The fingerboard of the guitar is made from rosewood. The back of the guitar is made from nato while the body of the guitar is made from combined laminated and solid wood. The bridge of the guitar is also made from rosewood. The guitar also has X bracing which helps with the tone of the guitar. The neck of the guitar is slim and the guitar has a natural satin finish. This guitar is a medium weighted guitar weighing just around 5.9 pounds. 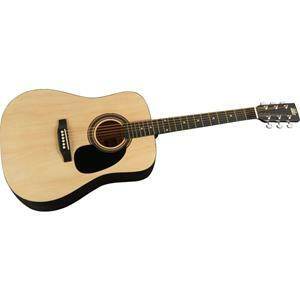 The Fender FA-100 Dreadnought is a very compatible guitar with great looks and an amazing music output. The top of the guitar is spruce shaped with natural gloss finish. The guitar also has an X bracing which helps with the music. The back and sides of the guitar are made from basswood. The neck of the guitar is made from maple while the fingerboard of the guitar is made from rosewood. The bridge of the guitar is made from rosewood and has compensated bone saddle. The guitar is considered as an ideal guitar for the beginners as it helps them to recognize their ability and helps them to perform better. This guitar is a little heavier than other guitars as it weights around 17.4 pounds. 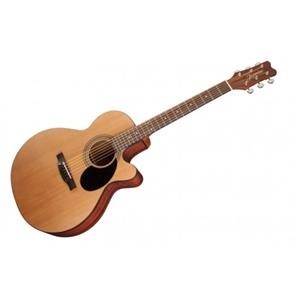 The Rogue RA-090 Dreadnought is a 6 string guitar with an amazing whitewood body. The guitar has a nato neck which gives great grip to the guitarist along with stability to the guitar. The bridge of the guitar is also made from maple along with its fingerboard which is also made from the same material. This guitar is usually preferred by the beginners as it helps them to evolve. The guitar has a balanced tone due to its body depth and width which gives an excellent music output. The aesthetics of the guitars are amazing as well. The shape, color and craftsmanship of the guitar are truly amazing which makes the guitar a very favorite choice among the youth. This is a medium weighted guitar weighing just around 8.8 pounds. While buying a new guitar, you need to consider various factors like what kind of music does the guitar generates. Also, if the guitar is perfect for the kind of music you wish to play with it. Also, there are other factors like the size and shape of the guitar, which needs to be considered. You don’t want to end up with a guitar with which you are not comfortable. Also, if the craftsmanship of the guitar is not that great, you might end up not liking the guitar you own. Another thing that matters is that if you like the material with which your guitar is made. Many people prefer a guitar that is made from natural wood rather than the one made from composite material. Also, if you are buying the guitar to take it along with you to different towns and tours, you need to make sure that the guitar is portable and durable at the same time. Also, its size should be small enough to make it easily portable at times. In such cases, it is preferable if the guitar is light weighted as the guitarist need to carry the guitar with him for most of the time. Thus, it becomes easy for the guitarist to carry his light weighted guitar from one place to another. Other things such as picks, pickups, cables, straps, capos, slides, tuners, etc. 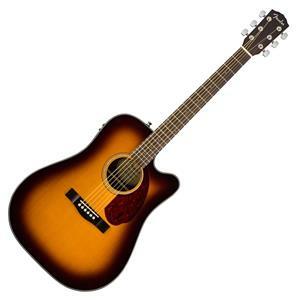 and its compatibility with the guitar also needs to be considered while buying the guitar. If the guitar is not compatible with the accessory that you have or wish to use, then you might need to buy another guitar with those features. Hence it is wise to check for the compatibility while buying it. If the person buying the guitar does not have any accessories, it is wiser to buy it with the guitar itself. He might get a good deal in buying such items together. Also the neck of the guitar should be slim, so that it could fit the guitarist’s hand easily. It is very important for the guitarist to have a good grip on the neck so that he might be comfortable while playing the music which in turns helps to enhance his performance. As it is a very difficult job to select a guitar under the budget of $200, we have shortlisted top 10 choices here which would make your job easier. We have considered guitars from all categories and have come up with these ten. While buying your favorite one among these, do consider the type of music you are playing, the features of the guitar, its size, weight, etc. All these factors are important while buying a guitar. Each guitar amongst these is different in its own way. You need to know which one of them are you more comfortable with and select it accordingly. Consider every last detail of the guitar while selecting it. Also consider its aesthetics along with the quality of sound generated. After buying a guitar, make sure to keep it well and try to avoid it from any damages as even a small amount of damages can change the quality of music delivered by the guitar. Prefer using a guitar cover at all times and try keeping it in a stand when it is not in use.